This species is accepted, and its native range is Borneo (E. Kalimantan). Habit - Climbing; stems clustering; not branching in the forest canopy; not dying after flowering. Plants dioecious. Leaf-sheath - Tubular for most of its length; stem and sheath together 1.08-1.32 cm; flagellum long; knee present; with spines similar to the rest of the sheath. Sheath surface lacking small horizontal ridges; without hairs or minute spines; green; with scales on surface; black. Leaf sheath with abundant spines; spines persistent; upward pointing; of more or less the same size; the larger spines laminar; the longest, excluding those at the mouth of the sheath less than 1cm. Spines straight; in life black; with hairy margins; the bases not swollen or crescent-like. Spines mostly not grouped. Spines around the leaf sheath mouth scarcely different from those on the rest of the sheath. Ocrea - Present; tattering; unarmed. 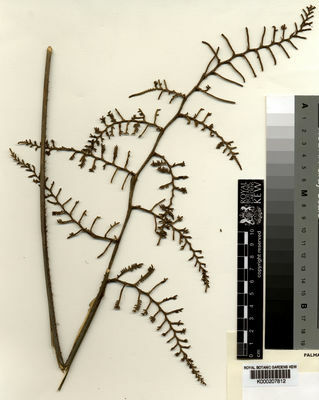 Leaf-stalk - Present, usually greater than 3cm; armed; with regular not grouped spines. Large well-defined auricles absent; blotches on petiole absent. Leaves - Cirrate; rachis armed; not hairy, or with minute rigid, brown hairs. Undersurface of newly emerged leaflets same as upper surface. Scales absent from leaflet surfaces. Leaflets sessile; 11 to 39 on each side of rachis; regularly spaced and parallel; held in a single plane; linear; the leaflet tip acuminate. Longest leaflet 19.8-24.2 cm; not exceeding 2cm wide; with bristles on both faces; the margins with bristles at tip only. Short, dark or dark-tipped up to 5mm long. Leaflets scarcely plicate; the veins not radiating; midrib not raised and prominent. Lowermost leaflets not reflexed across the stem. Apical leaflets joined to 1/4; not less than 4 cm long. Inflorescence - Inflorescence axis long, whip-like with clawed spines on the primary bracts; not rooting at its tip; much longer than the leaves; the first bract not enclosing the inflorescences at anthesis. Partial inflorescence present; bracts at the base of the partial inflorescences wholly tubular with a neat mouth or a small open limb, much shorter than the partial inflorescence. Rachilla lacking an enclosing bract; not at all pressed against the subtending bract. Flowers arranged in two rows. Male rachillae not less than 1 cm long. Bracts on the rachillae not net-like. A rare rattan of lowland forest in East Kalimantan.